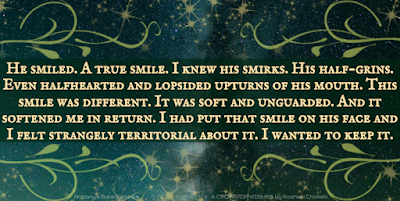 I bought myself a copy of Roshani Chokshi’s The Star Touched Queen last year, and immediately dove in. While the book started off absolutely brilliantly, in the middle, the writing and the magic fused to become a very vague thing which had me not loving it as much as I hoped I would. Truth be told, I’M SO SO SAD that this book is over because I LOVED EVERY SINGLE MINUTE OF IT, and now I’m going to miss Gauri and Vikram SO much. 1. 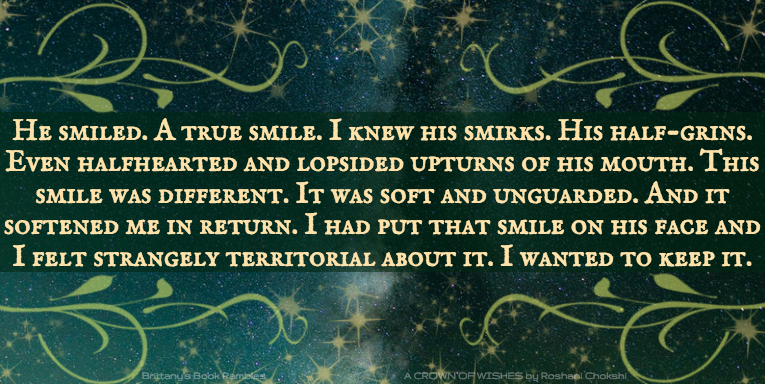 ROSHANI’S WRITING: If NOTHING else will make you believe in Magic, Roshani Chokshi’s writing style will. The way she crafts her words together, her descriptions about things both ordinary and extraordinary and just her general ability to bring everything alive on a page is unparalleled. I had at least four moments where I just sat back after a particularly well done scene and just MARVELLED AT THIS LADY’S SHEER TALENT. 2. GAURI AND VIKRAM: I loved these two characters together, but even more than that, I LOVED THEM INDIVUDIALLY TOO. The fact that this story was told from both their points of view, and showed us how they thought, their dreams, hopes and desires separately and then slowly, how they wanted the other was EVERYTHING I was looking for. I loved that there was no real distinction between general male and female roles. At no point was Gauri the weaker one or vice versa, and that the two of them needed each other equally. Their power, their wit and their courage was equally matched, which is just what all fantasies, contemporaries and real relationships need to be. 3. THE BANTER: Honestly, BEST. BANTER. EVER. I LOVED it. They were these two firecrackers being set off by and it was hilarious and filled with chemistry and made their relationship so much better. My heart exploded into feels in the last chapter of the book in the Ujjain gardens because AWWWWW. Seriously, best relationship development I’ve seen in a while. 4. THE PLOT: The plot is only second-best to the magical writing and perfect characters in this book, but that doesn’t mean it wasn’t GREAT anyway. I can’t describe it without spoiling the magical journey that Roshani’s journey will take you on, but suffice it to say that IT IS A VERY WELL CONSTRUCTED BOOK. Undeniably magical and witty, A Crown of Wishes is a book shaped masterpiece. 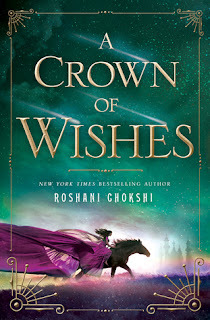 Have you gotten the chance to dive into Roshani Chokshi's books yet? What did you think of them? What are some of your favourite fantasy/ mythology filled books? HOW GORGEOUS ARE THESE COVERS ANYWAY?